Gorakhpur city lies on the eastern part of Uttar Pradesh, along the banks of famous Rapti river. The city is about 290 kms from the state capital Lucknow, while bordering close to Nepal. Gorakhpur is said to be the melting pot of three religions namely Hinduism, Buddhism and Islam. Since it is a religious centre, Gorakhpur houses the revered Gorakhnath temple along with other temples, several Buddhist sites of historic value, Makbara and Imambara of Muslims. This unique example of religions co-existing is unmatched in any other part of the world. This city is also the home of world’s largest publisher, Gita Press, of Hindu literature. Apart from this it is also the headquarters of the North Eastern Railways. Gorakhpur primarily thrives on service industries. Nevertheless, its importance has further increased as people migrate for higher education, state-of-art medical services and other facilities found here. Gorakhpur city is also unique in another way. Where can you find a place that has religious places, nature, sanctuary, mouth watering cuisine, rivers that gives soothing effect and other delightful places, under one roof so to speak? Yes! Gorakhpur has it all. The city of Gorakhpur is located between 26.7588° North Latitude and 83.3697’ East Longitude. The city is situated on the north-eastern corner of the state of Uttar Pradesh, with Rapti river towards north and Deoria district. The stream of the river forms the southern boundary with the district called Azamgarh. The place called Basti on the west joins Choti Gandak Nadi (a river), while Jharna Nala is a natural dividing line. The North side of the city faces Maharajganj district, Kushinagar and Nepal. The total land area of Gorakhpur is 5484 sq. km. The two main rivers Rapti and Rohani that originates from Nepal often inundate the Gorakhpur district. Demographically these two rivers give the city a concave-like shape. Unlike other parts of Uttar Pradesh, Gorakhpur stages distinct natural features. This is due to the proximity of the Himalayan range, which is few kilometer from the northern side of the city. Ramgarh Taal is one the lakes in Gorakhpur. It covers a huge area of about 725 hectares and embankment along its side measures about 18 km in distance. One can find Ramgarh Taal on the south east side of the city while Deoria district is on the south. Before it was cleared off, dense reeds which usually proliferate during the rains used to cover the river. The reeds were removed quoting environment and health reasons. Ramgarh Tal has variety of fishes thriving in it. People from several villages who are living on its bank not only enjoy fishing but also earns them a living. The Maheshara Lake Maniram is also known for its scenic beauty and that is why most of the Bhojpuri film production house prefers to shoot on this location. The Bakhira Sanctuary is a unique lake, one of its kind. 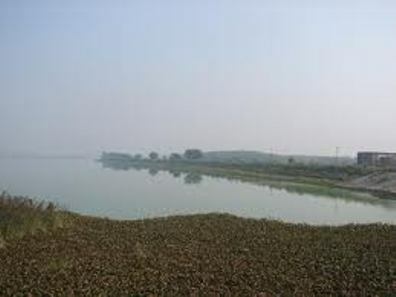 It is a largest natural wetland in Sant Kabir Nagar, situated at about 44 km west of Gorakhpur city. This gigantic water body is spread over an area of 30 sq. km. From ecological standpoint, it is an important lake, which provides a wintering and staging plain for vast majority of birds migrating from Eurasia and Asian subcontinent. It is also a breeding ground for birds residing throughout the year. The sanctuary is named after the village Bakhira which is close to the lake. However, there are several villages surrounding the lake. Many villagers who live in those villages depend on the sanctuary for livelihood in terms of agriculture, fishing and some other activities. Of course the authorities keep these villagers in check. The Gorakhpur city experiences humid subtropical climatic condition. This means during the summers one can expect intense perspiration with a degree of hot sun rays hitting their skin. The winters scale between somewhat moderate to very cold, when compared to other parts of Uttar Pradesh. It gets a fair share of rains. The rain water collected in the streams is absorbed by the soil making it damp as ever. Generally the temperature is warm and humid in Gorakhpur. May is the month when the temperature soars up till 40 degree Celsius. The average temperature during summers is 37 degree Celsius. Rain falls between June continuing till mid of September, bringing slight relief. Generally it becomes humid below the outer hills region after the rain. The temperature is pleasant during November but as January approaches temperature drops to as low 9 degree Celsius. Nevertheless, the temperature starts to become pleasant as the winter season wanes and the summer is about to set in. With such variety undoubtedly Gorakhpur attracts tourist not only from abroad but also from other states of India.